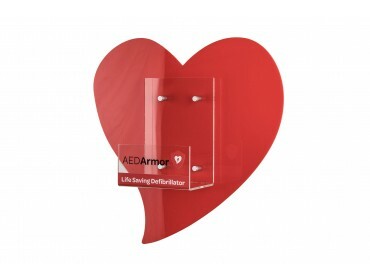 While AED Armor provides a variety of storage solutions, there’s none quite as unique or bold than the Perspex Heart Wall Bracket. Designed to be eye-catching and vibrant, this wall bracket and heart combination provides a simple, yet effective way to store your life-saving investment, ensuring everyone who frequents the location is aware of the device’s location. All Perspex storage options include 4 matte fixings to allow for a sleek, simple design and way to install your storage solution. The bright heart feature of this product will ensure everyone in the area, whether they frequently visit or not are aware of the location of the life-saving AED. Wall brackets are one of the simplest storage solutions for AEDs as rescuers are able to retrieve the unit quickly without worrying about opening cabinets and inputting codes. Whether you’re looking for more information about this product or any of our other listed products, the AED Armor team are the ones to call. To get in touch, 0333 678 0246.